2019 i.e. the new year has started. In last year's Tech Sector, the trend of smartphones with watermark display display was found and companies like Huawei and Samsung launched their first selfie cutout smartphones in the year-end. This year, it is also expected that the display of self-contained smartphones for self-censored sensors can be launched. While 5G is eagerly waiting around the world, handset maker companies can present the 5G support handsets this year considering the demand of the customers. If you are also a tech lover and are eager to know which smartphones are glued to the world around this year, then today we will give you information about this by your articles. In the year 2018 the sale of tech sector giant Apple has not been particularly good. Now, what is going to be seen now is that in 2019, what strategy does the company now fall in? At the moment, it is not possible to say whether Apple will launch an affordable smartphone this year to increase its sales in 2019. 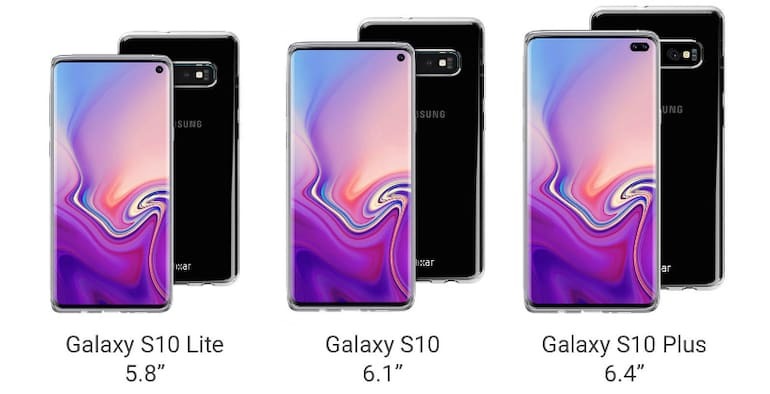 South Korean mobile maker Samsung will launch its flagship smartphone Galaxy S10, Galaxy S10 Lite and premium variant Galaxy S10 + this year. In such a scenario, customers who buy Samsung's company's smartphones will be on these smartphones. Some time back the information was that the company's premium variant could come with Infinity-O display panel. Galaxy S10 + is expected to have a 6.4 inch quad HD + (1440x3040 pixels) display. It is being said that Samsung will also offer holographic technology in these Galaxy series handsets. The report that was revealed some time ago claimed that the Galaxy S10 handset will come with 93.4 percent screen to body ratio. These handsets are expected to launch just before the Mobile World Congress (MWC 2019). Nokia brand phone maker HMD Global can launch its flagship smartphone Nokia 9 PureView this year. Recently the price of Nokia 9 PureView was also leaked. Nokia 9 PureView equipped with Penta-lens camera setup is expected to be launched in the third or fourth week of January 2019. HMD Global raises curtains from its new model every year during the Mobile World Congress 2019. But this time, the company is preparing to launch the Nokia 9 PureView before MWC 2019. The Nokia 9 PureView initial price can be 749 Euro (about Rs 59,600) or 799 Euro (about 63,600 rupees). The handset maker Huawei can take a look at the P-30 series this year. Under the P-30 series, the Huawei P30 and the Huawei P30 Pro smartphone are expected to be launched. Recently, the concept render video of the company's P30 Pro appeared on YouTube. This video, related to the Huvaw P30 Pro, is 2 minutes and 59 seconds. There is a glimpse of thin bezel and waterdrop display design in the video. Like the Huawei P20 Pro, there is also a curved edge in the P30 Pro. Huawei P30 Pro is expected to get the 38 megapixel Sony IMX607 sensor. This Exporter will come with RS Image Processing Technology. It is reported that the Oled Curved Display will be used in it. On the other hand, Triple Rear Camera Setup can be set up in Huawei P30. One of these sensors will be 40 megapixels. This sensor will be equipped with a 5x loseless zoom. Poko, the all brand of China's mobile maker, Shawomai, launched its Poco F1 smartphone in the Indian market last year. Now the talk about the Poko brand's next smartphone and upgraded version Poco F2 of Poko F1 is hot. Some time ago a concept render of Poco F2 came out. The design of the phone appearing in the render looks quite different from the Poco F1 design. Poco F2 saw a glimpse of the Waterdrop display. Due to this design, Poco F2 can have more screen-to-body ratio. Dual rear camera setup appears in vertical position in the concept render. The fingerprint sensor is on the back of the company's upcoming smartphone. This concept is render, so that many changes can be seen in the last design of the phone. Poco F1 recently got the Mui 10 upgrade based on the Android 9.0 pie. Apart from this, the first Poko F1 handset came with the Snapdragon 845 processor. In this way, we can expect the Snapdragon 855 processor in the Next generation device. The handset manufacturer, OnePlus, launched a Plus 6 smartphone last year and now this year the company can take a look at One Plus 7. It is said that the company can present its 5G support handsets this year. The company had claimed during the Qualcomm Snapdragon Technology Summit 2018 last year that it will bring the world's first 5G smartphone, which will work on network EE in the United Kingdom. OnePlus CEO Pete Lau also claimed in the summit that the company's next flagship handset would be one of the earliest phones coming with the Snapdragon 855 processor. So, hopefully SnapDragon 855 chipset can be used in OnePlus 7. The look of the phone and its other features are all glimpsed. Xiaomi can present Xiaomi Mi8 smartphone upgrade version Xiaomi Mi 9 in the Chinese market this year. This flagship smartphone from Shaomi will come with triple rear camera setup and Qualcomm Snapdragon 855 processor. The smartphone has 48 megapixel Sony IMX586 sensor, 32-watt charging, 24-megapixel selfie camera, 6.4-inch display, micro 9 software and 3,500 mAh battery. The price of this phone is also leaked. In the Chinese market, the price of the Mi9 handset can be 2,999 Chinese yuan (about 30,400 rupees). Speaking of specification, Shaomi Mi 9 will run on the MUI 9 based on Android pie. There will be a 6.4-inch full-HD + Amoled display, 19: 9 aspect ratios. It will come with Snapdragon 855 processor. RAM will be 6 GB and storage 128 GB By the way, there is hope for more premium versions.